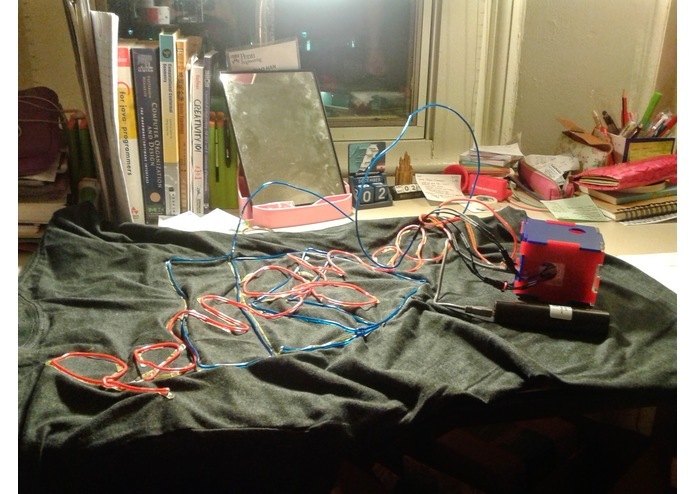 EL Wire clothes that are both safe and cool. Nowadays, cycling has become a popular and eco-friendly activity. However, there are certain safety issues related to cycling, especially cycling at night and mountain biking. Individual bikers lack of signals to communicate with others members in the group, and other moving vehicles might not notice the cyclists at night. This danger extends to pedestrians and motorcyclists, and operating at night can even be perilous for law enforcement and workers We have created a portable gadget with EL wires that can be switched on to increase one's visibility to others. Additionally, when the wearer surpasses a certain acceleration threshold, the EL Wires that are attached to the attire of the user will be lit up in certain patterns and thus notify the surrounding people as well as the user of the speed variation. Besides solving safety issues, the accelerometer-controlled EL wires system can also serve for aesthetic purposes. 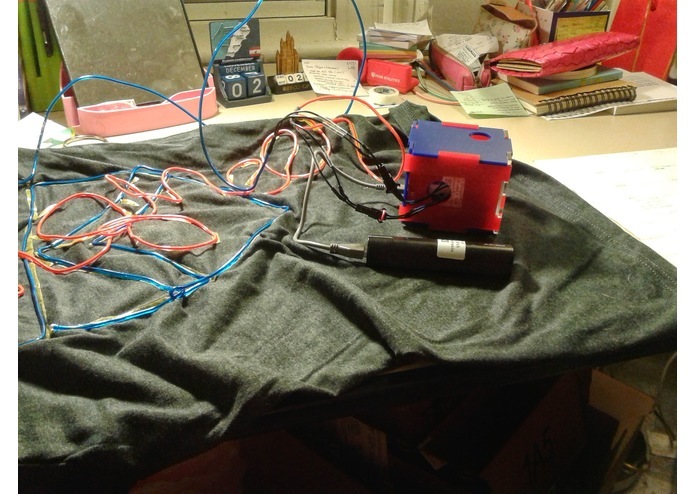 For this part, we intended to connect the arduino with a bluetooth module and control the patterns via some phone app. For instance, we can change the desired threshold for the wires to light up, the frequency of flashing, the different color patterns and variation of intensity. The possibilities are limited only by imagination. 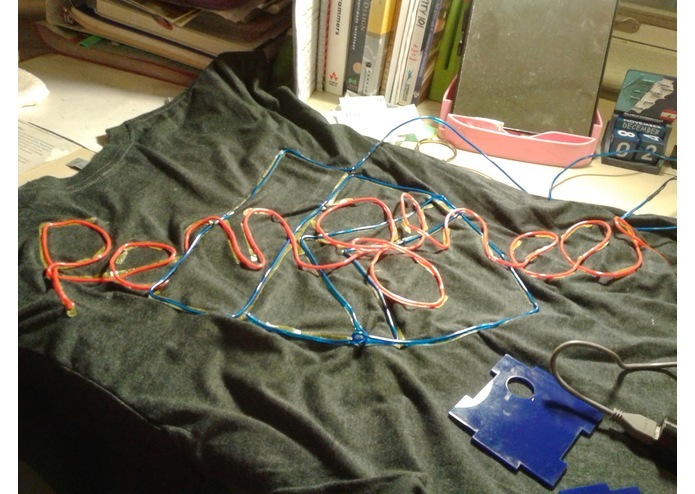 On the design side, we laser-cut the shell to contain the electronic components, and we made the Penn shield and the term "Pengineer" on a shirt using red and blue color EL wires. 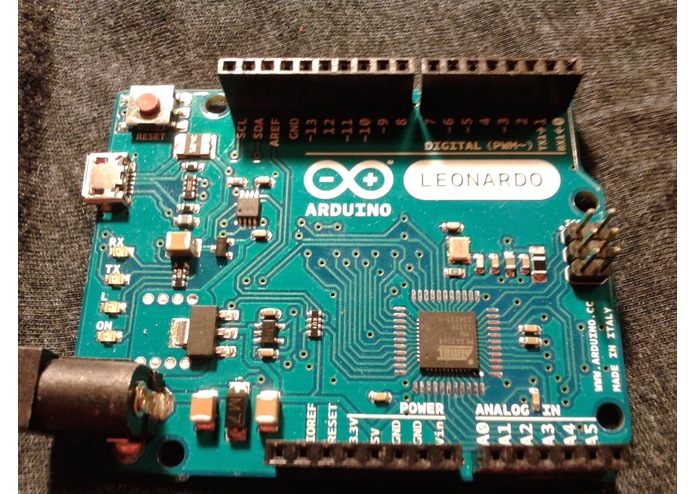 SafeGlow is controlled with an Arduino Leonardo microcontroller with a breadboard shield attachment. 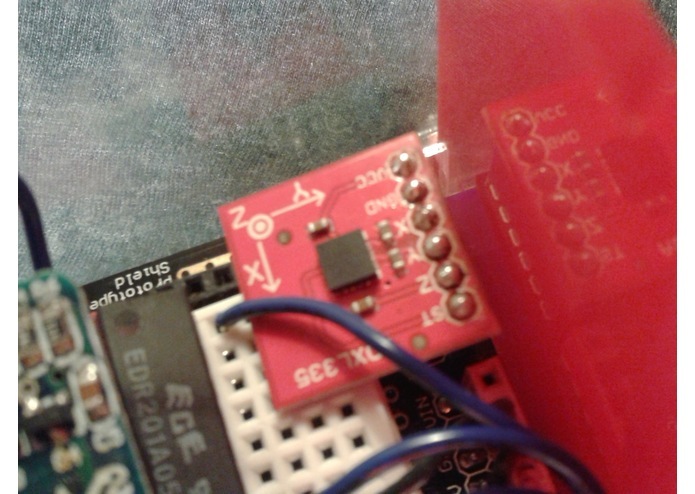 An accelerometer is attached to the dedicated analog pins. The data from the three axes - x, y, and z - of the accelerometer is read in and the magnitude of acceleration calculated between iterations of the light patterns. 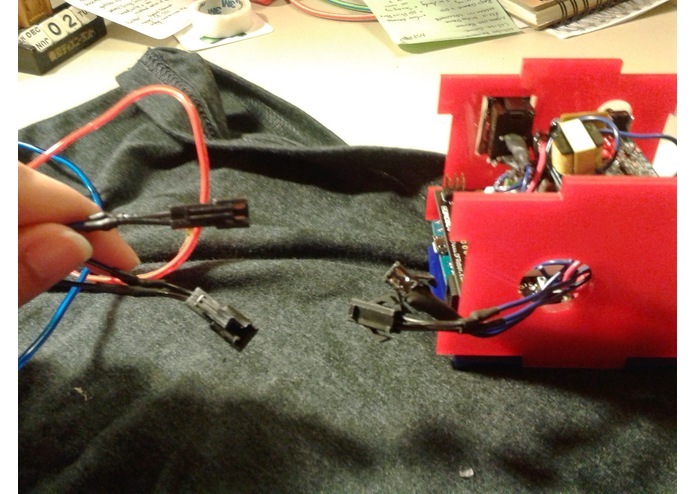 The accelerometer is calibrated by switching on a switch, which turns on an LED that turns off after the device finishes calibrating, which takes approximately 1 second. 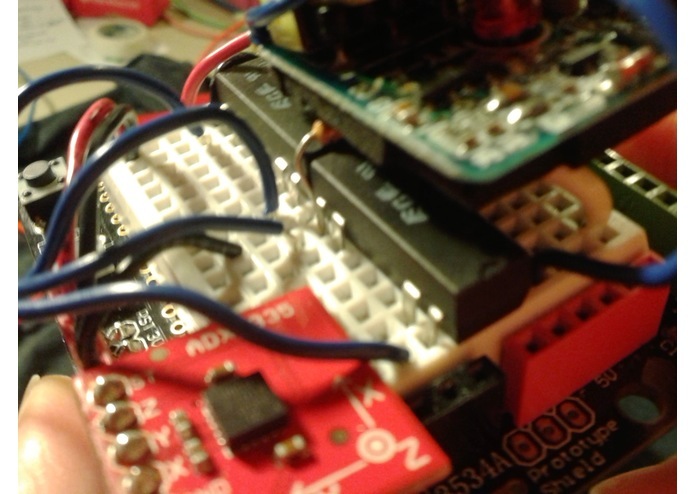 Data from the accelerometer is only read in while this switch is turned on. 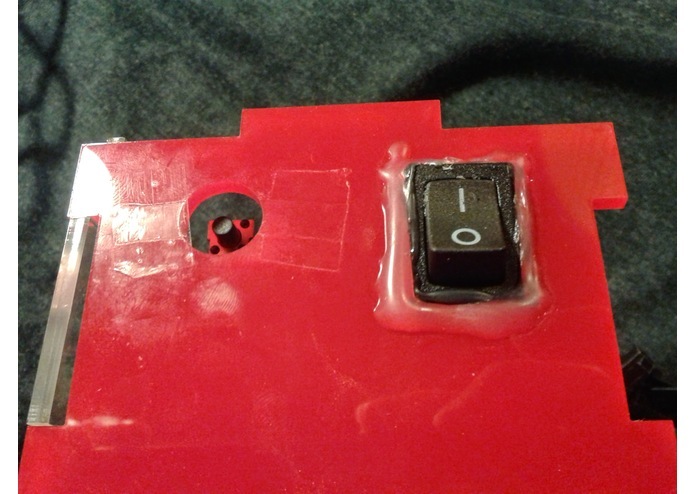 This itself is due to a condition in the code requiring current to run to one of the pins for each iteration of the loop, which is only possible when the switch is closed. The EL wires require alternating current to glow, so we took apart an AC Inverter and attached the circuitry within to our board. 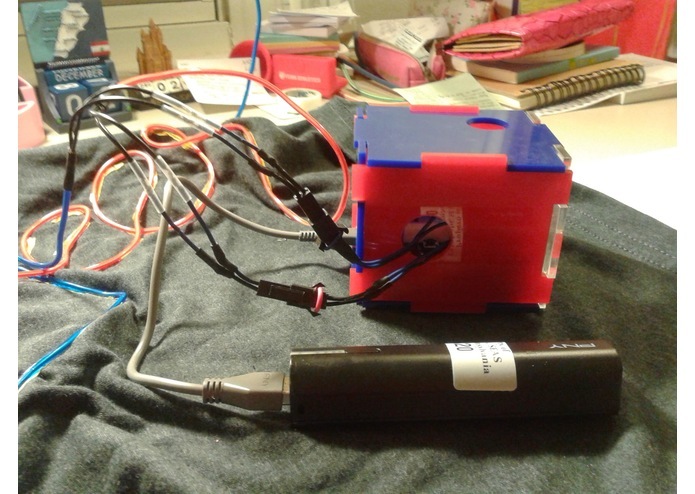 The inverter is powered by the arduino while still maintaining its function in powering the EL wires. Actually controlling the light patterns outside of the built-in flash-rate control of the inverter required switches that could be controlled by the digital pins while still allowing alternating current to flow. The power to the inverter could not be switched on and off as that would reset the inverter each time and require it to be turned back on manually. 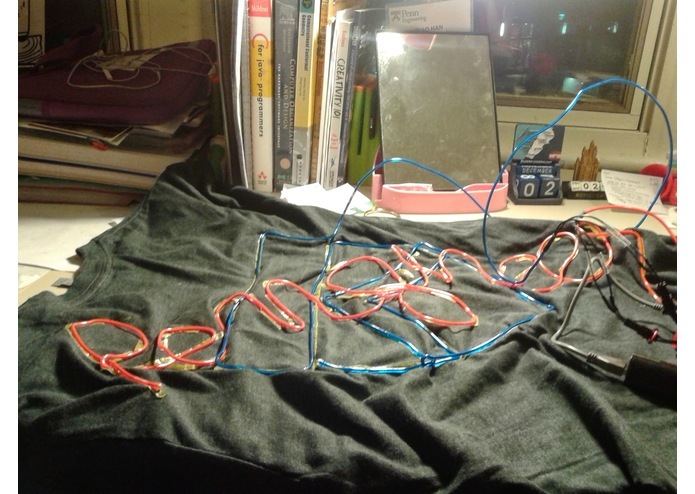 Therefore, we used a pair of 5V relays, one relay for each EL wire. 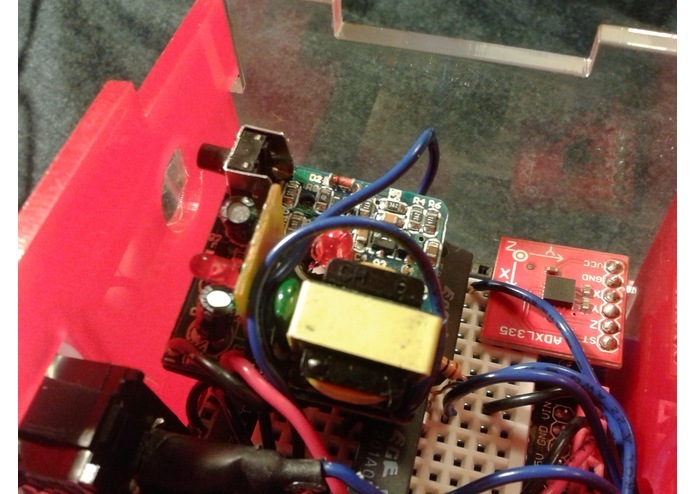 One wire from the inverter went to each relay, and one wire from each EL wire went to an normally open pin and the other to a normally closed pin. 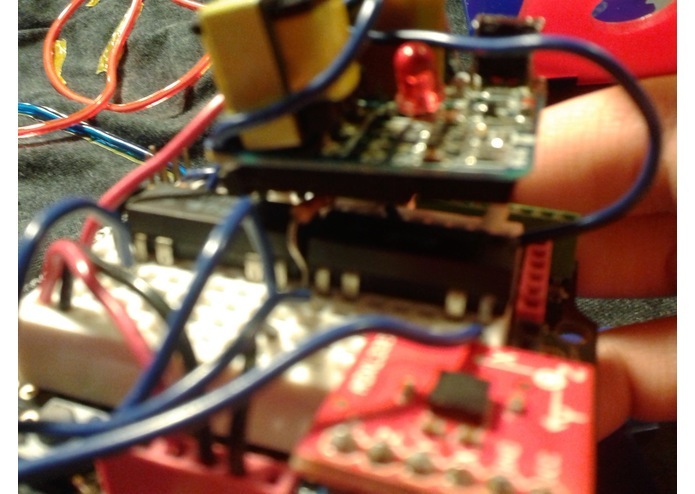 This meant that both wires could be powered by the same inverter but controlled by separate relay switches, allowing for programmable patterns based solely on whether power was sent to its relay and without AC causing problems with the arduino. 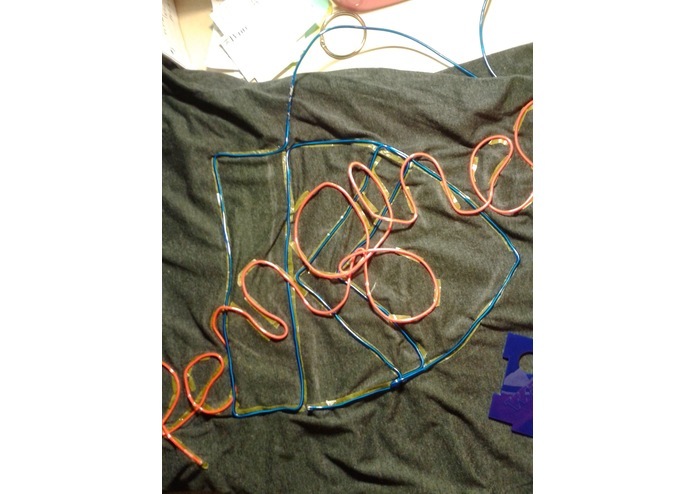 The electroluminescent wires themselves are a phosphor-coated thin copper wire, two wires wrapping around it that receive current, and a translucent colored PVC sleeve to protect it and give it the desired color. 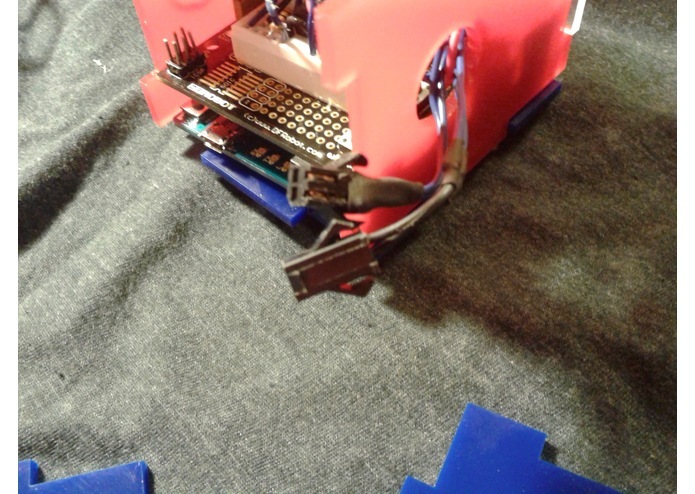 The two wires that receive current were sodered onto a clip that locks onto its counterpart attached to wires going to the relays. 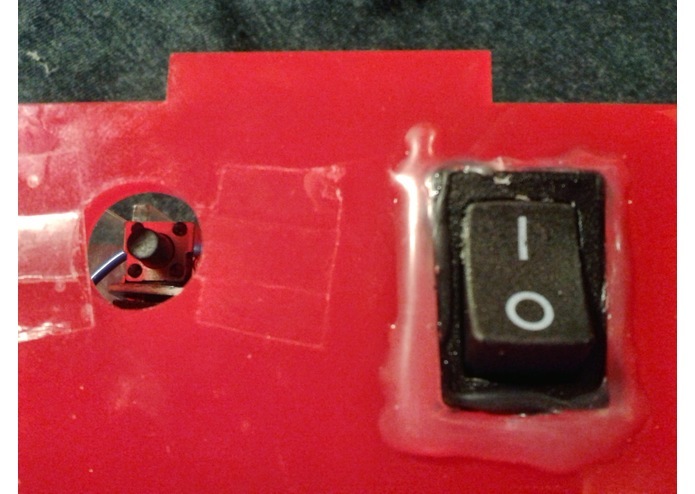 This allows for easy attachment and removal of the wires from the box and making it easier to wear. This also contributes to the clothes being machine washable as long as the clip is properly dried. 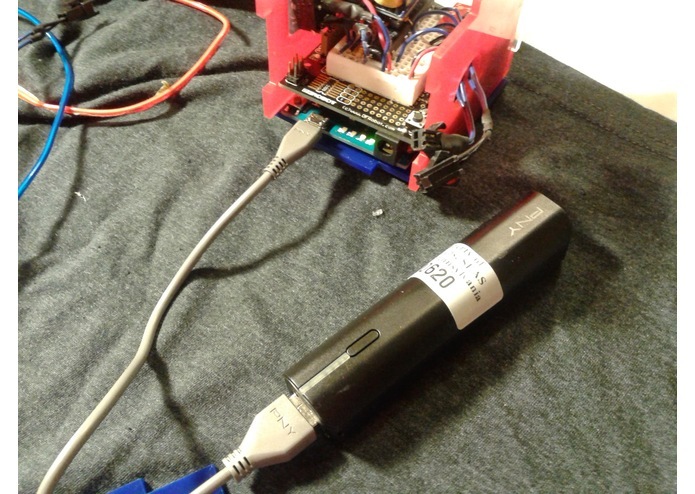 The device is currently powered by a lithium-ion battery pack, which connects to the arduino via a USB cable and is also rechargeable. 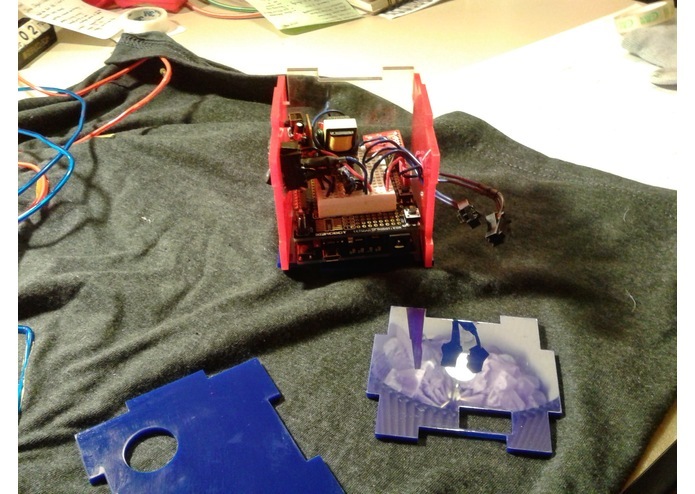 It is small enough to be carried in a pocket while the box containing the arduino and other circuitry can clip onto the waistband.